Recently, I've developped an obsession with jewellery with animals on them. I'm not a fan or animal print, but I just love having little animals on my jewellery. I don't really like animal print on clothes either but I really like insect jewellery!! Not spiders, as it's a bit too goth, or butterflies, as they're a bit ubiquitous but dragonflies and ladybirds and scarabs, oh yes! Owls remind me of my Grandma, she used to collect owl figurines. cute necklace! I can definitely understand the appeal, I love animal jewellary! Definitely liking the animal jewelry! And that necklace is so cute! Awww I love that necklace. So cute! :) And I totally agree with you. Rings and necklaces and earrings with little animals on them are so fun! Oh my gosh, that's the most adorable necklace I think I've ever seen! Love your collage, darling S! So many fab pieces! I have seen a lot of animals too lately, that owl was a fun find!! I've always wanted a bangle with an animal on it!! Love that spider cuff and that owl necklace!! :) SO cool! oh i love owl necklaces. and other birds. that polyvore set is so cute. i LOVE that little owl necklace!! i wanted to stop by and tell you that i gave you a kreativ blogger award on my blog. My kind of animal jewelry consists mostly of sea creatures - I just adore starfish and seahorses on my accessories! I love the seahorse earrings you've posted - so cute! Hey just wanted to let you girls know I gave you an award on my blog! 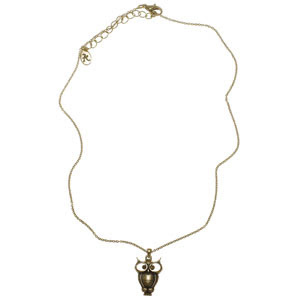 Oh my, that owl necklace is adorable! I think I'll have to drop by Accessorize asap! I know what you mean with animal jewelry though...I used to have a thing for ladybirds, which I have on pendants and I also have a small collection of butterfly brooches. Love your picks! Love all of these especially the owl necklace .x.